It's not the first poop joke Deadpool has ever unleashed, nor is it likely to be the last. 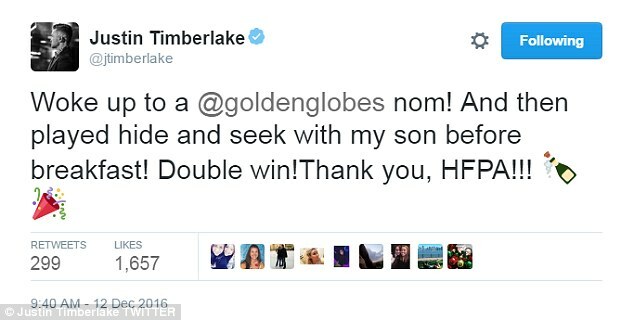 Ryan Reynolds revealed he was 'staring down the barrel of one hell of a dirty diaper' when he received the news of his surprise Golden Globe nomination on Monday morning. The 40-year-old was nominated for best comedy/musical actor for his eponymous turn in the comicbook smash hit Deadpool, which was also nominated for best comedy/musical film. 'It is meaningful to me,' he said. 'I’ve been acting professionally for 25 years, to varying degrees of success, and it’s a special moment to see something that you’ve stuck with for the long game pay off. The Vancouver native admitted he was shocked to see the film nominated in two categories; it is the first comicbook superhero movie to ever get a nod from the Hollywood Foreign Press Association. 'Seeing the movie nominated is a real glass ceiling moment for the genre,' he continued. 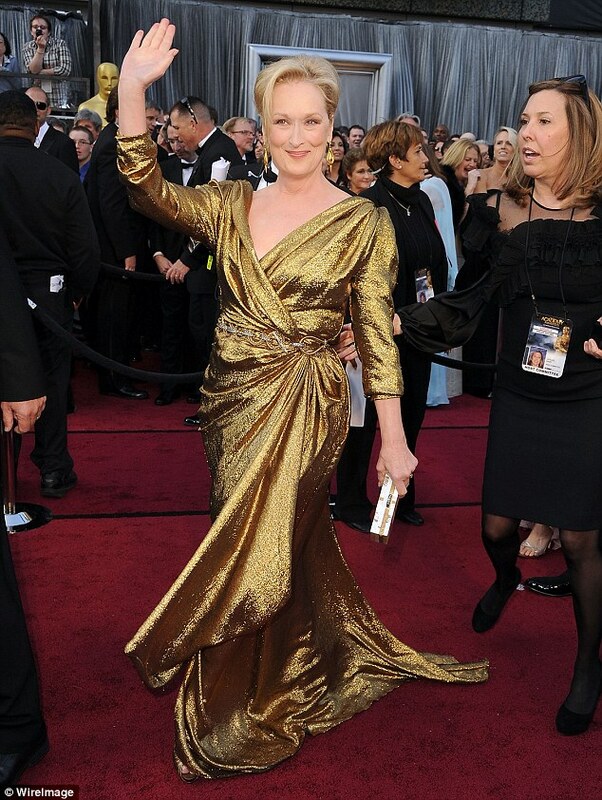 'I’ve always said that I wish the Oscars had a category for comedy as well. It’s not an easy job. 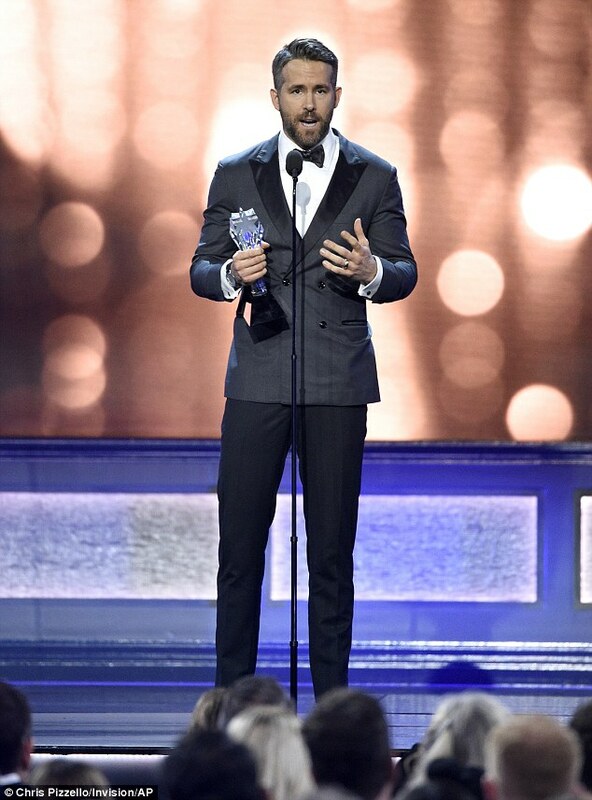 Reynolds, who landed the Critics' Choice Award for Entertainer Of The Year just hours earlier, was one of the first stars to react to his on Monday morning. 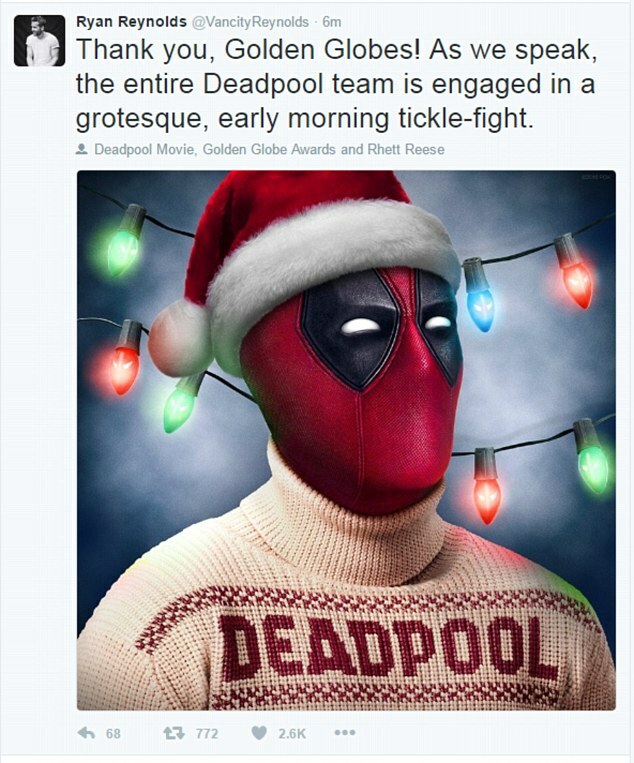 The actor shared a funny tweet with the Deadpool character wearing a Santa hat. Ryan told ET Canada that he and Blake were going to celebrate the nomination with a date night. 'I think tonight, we’re gonna go out for a nice dinner. I think we’re going to have date night, just she and I,' said Ryan, who called his wife an 'invisible partner'. 'She was so helpful with Deadpool and I bounced so many ideas off of her, and I worked with her with so many of the little nuances on the character. She’s been a de facto coach for me in so many ways,' he added. Natalie Portman, who was nominated for Jackie, said: 'I'm so honored to be recognized by the Hollywood Foreign Press Association. The star is pregnant with her second child. 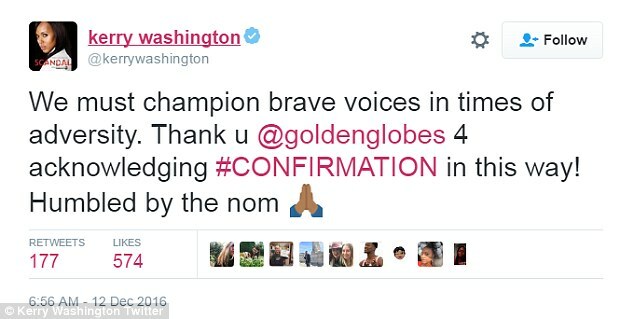 Kerry Washington was Golden Globe nominated for her turn in Confirmation. 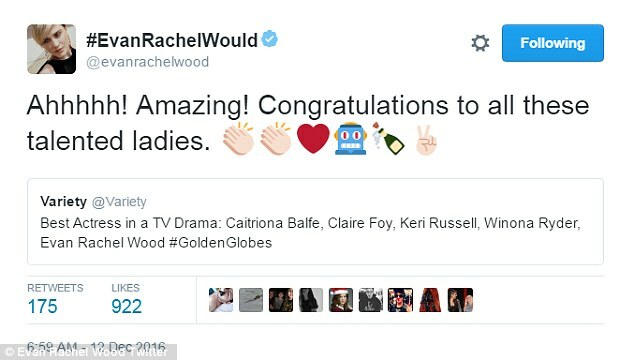 The actress took to Twitter to express her joy. 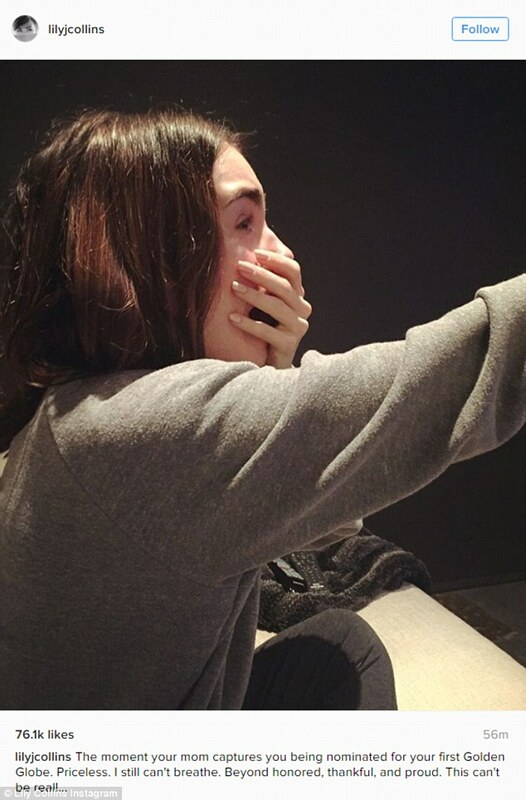 Lily Collins seemed to be in shock. 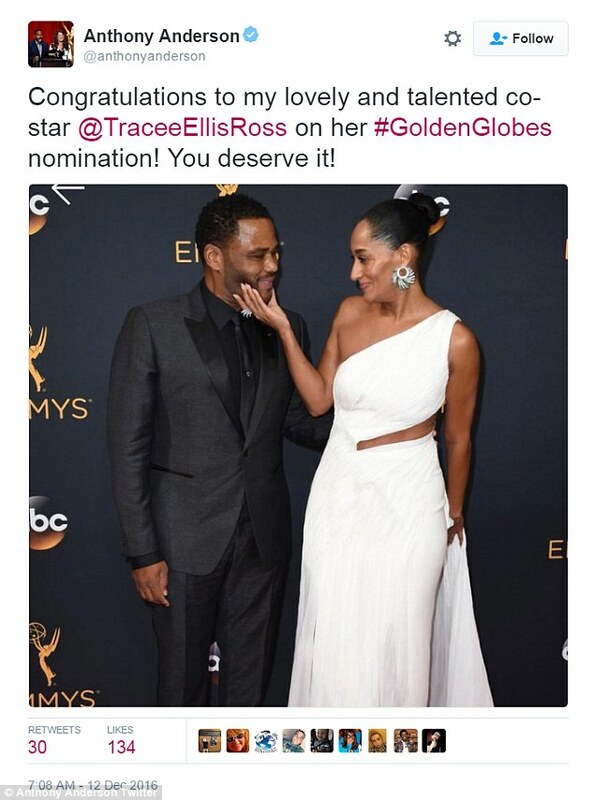 The brunette beauty shared a photo where she had her hand over her mouth after being nominated for Rules Don't Apply, which was directed by Warren Beatty. Amy Adams, who got a nod for her turn in The Arrival, said: 'Thank you so much to the Hollywood Foreign Press Association who have always been so incredibly supportive of me throughout my career. 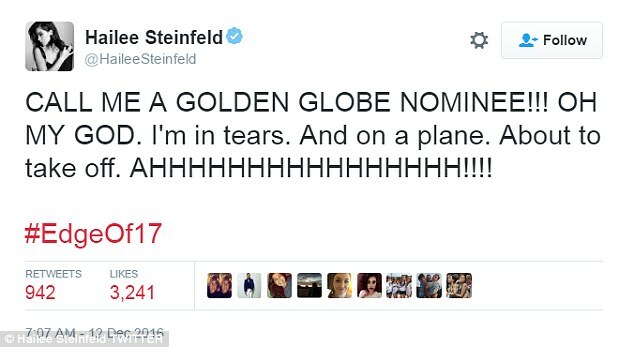 Hailee Steinfeld shared that she was in tears over her nom for The Edge Of Seventeen. 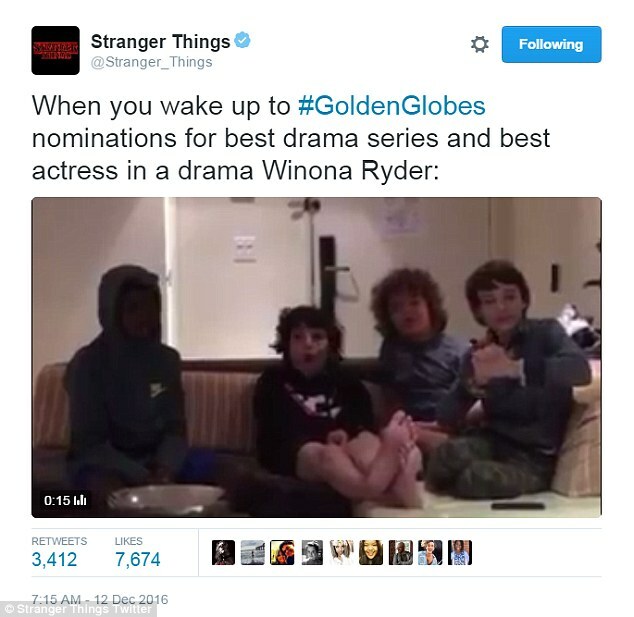 And Christian Slater tweeted: 'Can't express the level of excitement and gratitude I felt to wake up to a Golden Globes nomination. Thank you HFPA!' 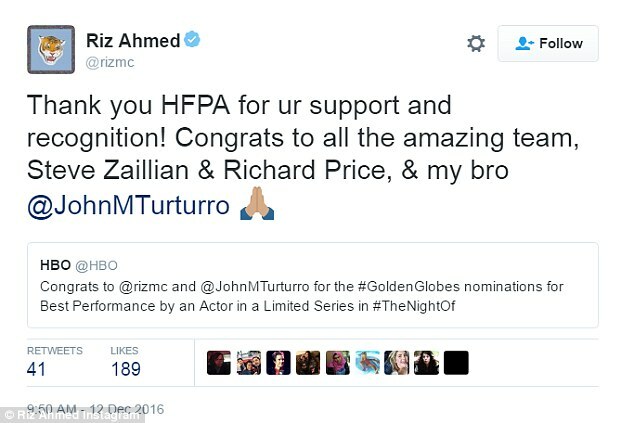 He was nominated for his TV show Mr Robot. There is already a clear favorite on the list. La La Land looks set to dance its way to the top this awards season as it picked up a staggering seven nominations. 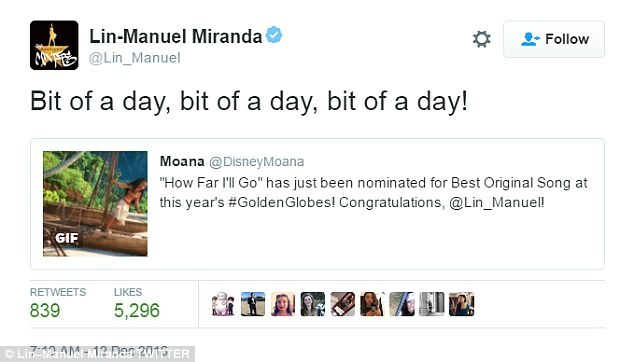 The musical - led by Emma and Ryan - picked up nods in almost all major film categories outside the Drama nominees. The film picked up acting nominations for its leads Stone and Gosling in the Musical Or Comedy categories, as well as Best Motion Picture – Musical or Comedy, Best Director for Damien Chazelle, Best Original Screenplay, Best Original Score, and Best Song. La La Land harks back to Tinseltown's golden era of big musicals, with Emma Stone and Ryan Gosling playing an odd couple who find themselves house-sitting after a string of personal disasters and swept the board at the Critics' Choice Awards on Sunday. The list of potential winners were revealed at dawn in Beverly Hills by Don Cheadle, Laura Dern and Anna Kendrick and are decided by the Hollywood Foreign Press Association (HFPA). This year's nominations break tradition and come before those of the revered Screen Actors Guild, making the Golden Globes nods the biggest indicator of you will be up for Hollywood's most-sought after prize, the Academy Award. 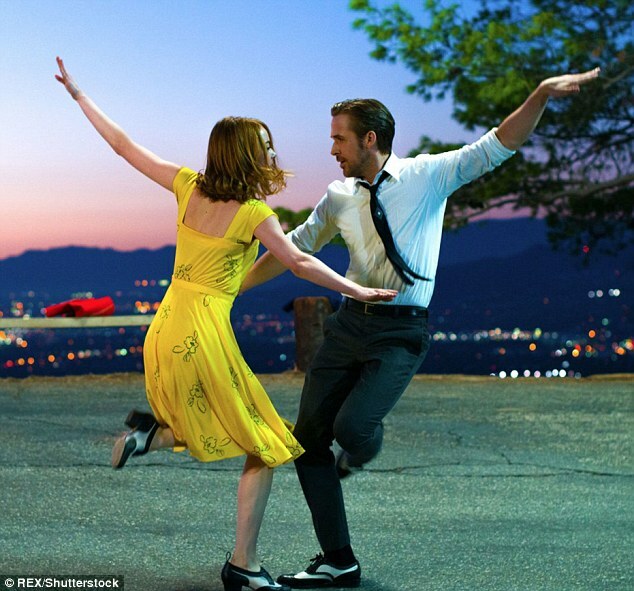 Up against La La Land for Best Motion Picture - Musical or Comedy are 20th Century Women, Deadpool, Sing Street and Florence Foster Jenkins. La La Land looks set to dance its way to the top this awards season as it picked up a staggering seven nominations for the 2017 Golden Globe Awards. The musical - led by Emma Stone and Ryan Gosling - picked up nods in almost all major film categories outside the Drama nominees. In the Best Motion Picture - Drama the battle is between Hacksaw Ridge, Hell or High Water, Lion, Manchester By The Sea and Moonlight. 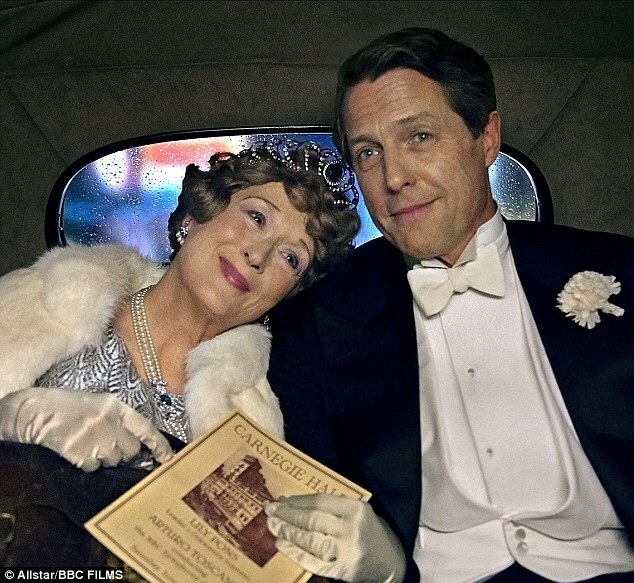 Up against this year's golden couple Emma and Ryan are an established crowd - against Emma in the Best Performance by an Actress in a Motion Picture - Musical or Comedy are Annette Bening (20th Century Women), Lily Collins (Rules Don’t Apply), Hailee Steinfeld (The Edge of Seventeen) and the evergreen Meryl Streep (Florence Foster Jenkins). Ryan will face Colin Farrell (The Lobster), Hugh Grant (Florence Foster Jenkins), Jonah Hill (War Dogs) and Ryan Reynolds (Deadpool). In the acting categories for Drama - Best Actor is between Casey Affleck, Joel Edgerton, Andrew Garfield, Viggo Mortensen and Denzel Washington. Best Actress will be between Amy Adams (Arrival), Jessica Chastain (Miss Sloane), Ruth Negga (Loving), Natalie Portman (Jackie) and Isabelle Huppert (Elle). Other big nominees include Moonlight (six nominations), Manchester by the Sea (five nominations) and TV movie The People v. O.J. 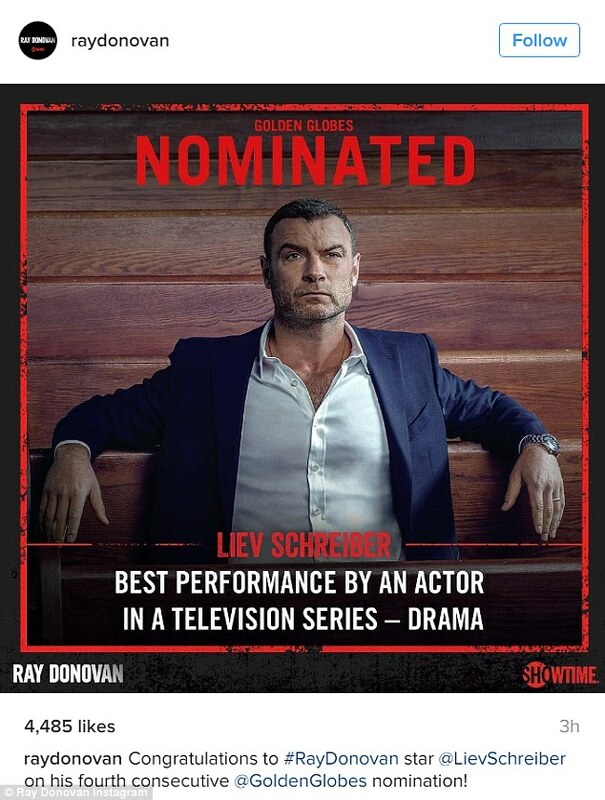 Simpson: American Crime Story (five nominations). The 74th Golden Globe Awards will air live from the Beverly Hilton in Beverly Hills on Sunday, January 8 and will be hosted by Jimmy Fallon.